This article will give you ideas about how to eat right while living with multiple myeloma (MM) and about how to deal with eating problems, should they occur. When you have MM, there is no specific diet to follow unless your healthcare team has directed you to avoid certain foods. But eating a healthy, balanced diet can help you maintain your general health and well-being. 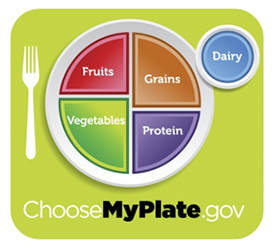 To get started, consider this basic guide from the United States Department of Agriculture (USDA) Center for Nutrition Policy and Promotion on how to fill your plate with a balance of foods from different food groups. It’s also important to talk with your healthcare team about the food choices that are right for you. Be sure to ask about any foods or drinks you should avoid. And always ask your doctor before starting a new diet or taking any vitamins or herbal or nutritional supplements. Eating right can be difficult when you have MM. Both the cancer and its treatments can affect you in many ways. You may lose your appetite and not want to eat. Or, you may eat too much and gain unwanted weight. You may also experience symptoms such as nausea and vomiting, loose stools or constipation, or a sore, dry mouth. Remember, always check with your doctor before starting a diet or exercise program, or before taking any vitamins (like vitamin D, calcium, or iron) or herbal or nutritional supplements. Only your doctor can tell you what’s safe for you.